Yesterday, a friend of mine treated me to a birthday breakfast at a place in downtown Woodstock. After our incredibly yummy meal, I asked her if we could walk around for a little while, so I could search for a perfect Sunday photo. The previous night brought with it mild temperatures and storms, though the morning greeted us with a chilly dampness that cut to the bone. Downtown Woodstock has several cute shops, but my jacketless-self was a little too cold to spend too much time window and photo shopping. Thankfully, the perfect shot was easy to locate. May your Sunday be one of gratitude, peace and comfort. 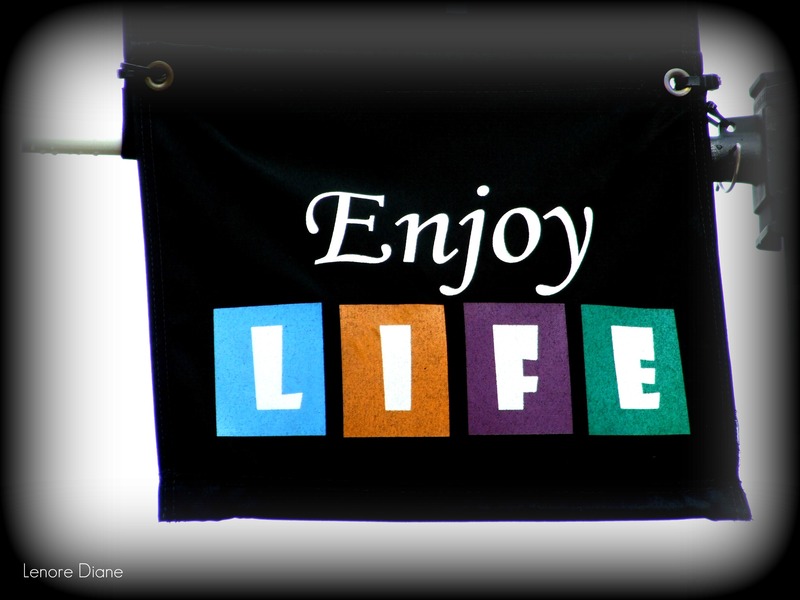 May you enjoy life! Oh, and thanks for the birthday breakfast, Betty! Hello Mags, thank you very much. I was excited to find the shot. Any time Veronica! We should make that a quarterly outing! You are absolutely right about that, Betty. It’s a date … quarterly. Happy Birthday Lenore!! love this shot. Thank you, Stasha! I accept the happy wishes, and I am glad you loved my shot. Not even a shake on the camera with the shivering. Well done! Funny thing, Amy… I had the camera switched to ‘shakey’ mode, or whatever you call it. I was most definitely shivering! 🙂 Glad you liked it. Happy Birthday, Lenore! And thank you for this beautiful reminder! Thank you, Priya, and you’re welcome. Something tells me you are skilled at enjoying life. Sounds like a lovely place to explore…when one is dressed appropriately! It is, Patti. I will make sure to dress appropriately next time, too. Whatever. Just remember, Bridget… enjoy life! Um, are you enjoying it yet? Finding a great shot is always enjoyable, isn’t it?! It is enjoyable. Especially for my Sunday posts. It has to be ‘perfect’.